It is with great pleasure I present to you all the new cover of Pegasus Falling. I’m really pleased with this new look for the first part of the Cypress Branches trilogy. It has taken a long time to get to this point, this being the fifth (and hopefully final!) version of the cover. The previous four covers were all very similar, with small changes to the original picture of Lesley holding Sammy’s Paratrooper’s cap in her hands. Although I liked the image, and readers kept telling me they liked it too, I was never entirely happy with it as a cover. There was a certain something lacking which I couldn’t put my finger on. For a while I had had the idea of using the image within a wider context. 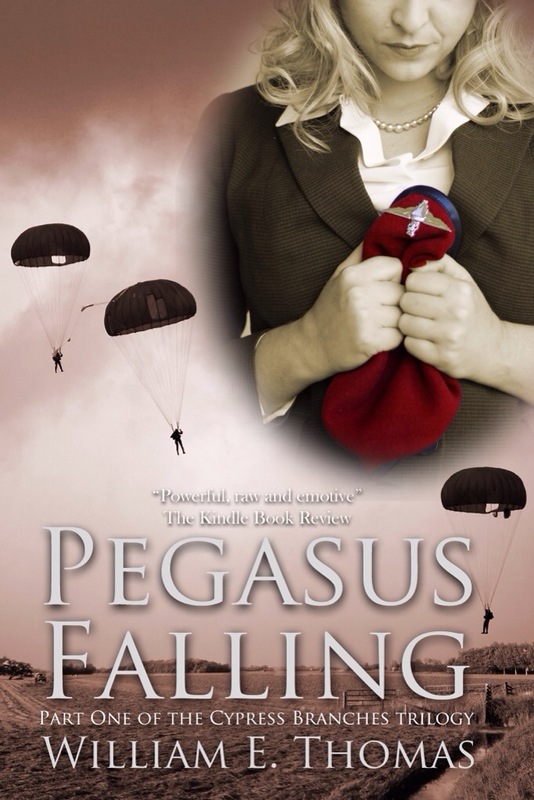 When I created the cover for The Bridge (William’s short story available to download for free), I considered using the haunting image of falling paratroopers on the cover of Pegasus Falling as well. I had a play around, but didn’t come up with anything satisfactory and left things as they were. However, a few months ago, I opened up Photoshop again and had another play. This time, inspiration must have struck and I was much happier with the result. The original image of Lesley holding the red beret (captured brilliantly by photographer Dewi Clough) remains, but as part of a much more dynamic whole. With the 70th anniversary of the Battle of Arnhem coming up next month, I’m really pleased that I have been able to include two bold key images portraying the British Parachute Regiment on the cover. The regiment, then newly formed, played an important part in the infamous and controversial operation which forms the backdrop for the opening scenes of the book. Even more poignantly, the author was a witness to those appalling scenes he describes so vividly – he was 18 when he fought on the front line at Arnhem, and used his experiences to tell his story. I’d love to know what readers think of the new cover, so please do leave a comment or get in touch.